Our new eStudies format combines rich media including videos and resource links into interactive PDFs. These can be viewed on computers and tablets. Teachers may download and photocopy pages for their students under the CAL copyright agreement. For access to eStudies simply register. $77 per year including GST. These are headstones on the graves of Australians on the Western Front. They can tell your students about the people who died, but also about the attitudes and values and feelings of the families who provided the words. 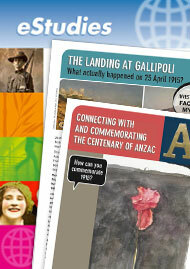 This is one of the classroom activities that your students can carry out through the Anzac Centenary School Link Program ACSLP. And they can go further: they can actually link with a school where these gravestones stand. They can work with students from that school to explore many more aspects of the experiences of the soldiers and the French and Belgian people who now live on the World War 1 battlefields. In short, they can investigate what these far-off communities can tell us today about the impact of war on communities in France, Belgium and Australia. (Ryebuck Media Pty Ltd, developers of the ACSLP for the Department of Veterans’ Affairs). You will be matched with a suitable school and given your own School Page on the website with your own user name and password. In the meantime we hope you find the video Walking in the Footsteps of the Condah Anzacs and the accompanying resources both challenging and engaging. The National Museum of Australia has developed a list of Defining Moments in Australian History that can be used as a basis for exploring parts of the Year 6 Australian History curriculum. Ryebuck Media, through the Australian History Mysteries website australianhistorymysteries has developed a web application, Convicts, Settlers and Immigrants (CSI) that allows students to create their own family timeline online, and to integrate that with the National Museum’s Defining Moments as they affect students’ own lives. This unit provides teachers with the resources and activities to have their Year 6 class use a family history approach to investigate aspects of the lives of Australians in the second half of the nineteenth century, and the early twentieth century. Students create an imaginary but realistic family that experiences a series of 20 key historical events. The students make choices for the family, and see what the consequences are. By using their imaginary family to explore the past, students develop a rich knowledge and understanding of Australian History, and a greater empathy with the lives of the people who lived through it. They do all this through an engaging and interactive classroom-based and practical online approach. But it is not only about the remote past. Students can take the next step, and apply the skills and approach they have been using for nineteenth century Australia to investigate their own families today and their place in modern Australian history. What do we know about the lives of people in Australia’s colonial past, and how do we know? How did an Australian colony develop over time, and why? How did colonial settlement change the environment? What were the significant events, and who were the significant people, that shaped Australian colonies? The impact of a significant development or event on an Australian colony. The National Museum of Australia has developed a list of Defining Moments in Australian History that can be used as a basis for exploring parts of the Year 9 Australian History curriculum. 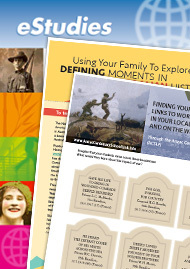 This unit provides teachers with the resources and activities to have their Year 9 class use a family history approach to investigate aspects of the lives of Australians in the second half of the nineteenth century, and the early twentieth century. Most of these troops were then sent to fight on the Western Front. Most of the Light Horse, however, became part of a British force whose aim was firstly to protect the Suez Canal from Ottoman attacks, and then push the Ottoman forces across the Sinai Desert, and then north through Palestine and Syria. What was the Palestine campaign? What was the Lighthorsemen’s experience of this campaign? What did the campaign achieve? Have you ever wondered why the state or territory you live in was settled after the arrival of the Europeans in 1788? Well you can be pretty sure it was for one of two main reasons – either as a gaol for convicts, or because of the land, to graze sheep or cattle. Three of the states were started as gaols - New South Wales, where the First Fleet arrived; Queensland, which began when Moreton Bay was settled, now called Brisbane, and Van Diemen’s Land, now known as Tasmania. But why were the other states and territories, originally called colonies, settled by the British Government? That is what you will investigate in this interactive unit. You will get the chance to examine the birth and growth of one colony in particular and then you will be able to use your own research skills to explore the history of your own state or territory. Should we change the constitution to recognise indigenous Australians? How have Indigenous people’s citizenship rights changed over time? One of the Australian History Mysteries for Year 10 is about the struggle for and achievement of Indigenous rights in Australia. 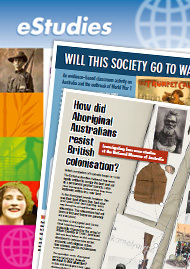 An online decision-maker activity on the Australian History Mysteries website looks at how those rights were won during the twentieth century. However despite the battle to win Indigenous rights there is one area where many people say Indigenous Australians do not have equality — they are not recognised in Australia’s ‘birth certificate’, the Constitution. The Australian Government plans to hold a referendum to change the Australian Constitution to recognise Aboriginal and Torres Strait Islander people in the that document. The aim of the referendum is to provide a change that will be historically accurate and just, and will help create a climate in which existing social and economic disadvantages for Aboriginal and Torres Strait Islander people can continue to be reduced. Australians focus heavily on Gallipoli, but it was on the Western front where most Australians served, where the greatest number died, and which constituted the most common Australian experience of the fighting. This unit provides a range of evidence — maps, diagrams, paintings, documents, photographs, timelines — to explore that personal experience. This analytical article by the National Museum of Australia’s Digital Learning Designer, Gabrielle Edwards, explores the key learning features embedded in this fun game. It is a simple but effective visual and interactive classroom resource for 1-4 students that promotes knowledge, understanding and empathy among students. Rated by student users: 9/10! 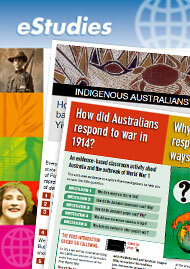 Have you found this hidden resource trove for history teachers? 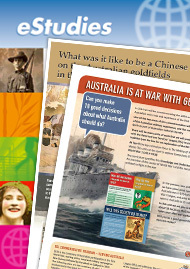 This article summarises the evidence-based classroom resources that have been specially developed on the Australian History Mysteries educational website for history teachers from years 3-10. We know a lot about the Australian soldiers of the First World War and the nature of the war they experienced. But what was life like on the home front? Were people united or divided? Were there pressures on men to enlist, women to become nurses, and people to raise money for the war? Were there pressures on people who did not volunteer to be conscripted and also on opponents of the war to keep quiet? The National Museum of Australia has an exhibition, The Home Front: Australia during the First World War, looking at the stories of 24 people who were in Australia during the war. In this unit we look at 16 of those people in 13 case studies, and use objects and other information to explore their experience of the war, to better understand the impacts of war on the Australian Home Front. The Landing at Gallipoli – what actually happened on 25 April 2015? 2015 is the 100th anniversary of the first major Australian involvement in World War 1 — the landing at Gallipoli. This unit looks at the events on the first day of the landing, a day which has become a major part of Australian national identity. The general impression of the first landing is that the Anzacs landed on the wrong beach, fought their way up the cliffs, fought bravely and well, but were defeated by the terrain, Mustafa Kemal, and the poor planning and leadership of the British generals. Much of this is myth, not fact. This unit asks students to record what they know or think they know about the landing. Then they explore some details of what actually happened. In doing this they explore both facts and the myths about the day, using evidence to help them develop their own knowledge and understanding. Connecting with and commemorating the Centenary of Anzac: How can you commemorate 1915? In the previous units in this series we have asked what type of society Australia was in 1914 when World War 1 began; what the reactions were in Australia to its outbreak; what decisions the society had to make once war had started and what happened at the landing at Anzac on 25 April. What do the people and events of 100 years ago, and their commemoration today, have to do with young people now? This unit looks at connections that you can make to the people and events of 100 years ago, and how you can commemorate these through individual Memorabilia, a local RSL and the men, women, institutions and memorials in community. In this unit students are faced with 10 decisions that the people and government of Australia faced in the first few months of the war, decisions about: enemy nationals, anti-German attitudes and propaganda, enemy trading ships in Australian ports, trade with Germany and German businesses, German New Guinea, transporting men and animals to war, and the German raider Emden. Students have information and a set of plausible options, and have to decide what the best decision is for Australia in each case. They then see what decisions were actually made, and can critically evaluate each of those decisions. What was it like to be a Chinese miner on the Australian goldfields in the 19th century? Hundreds of thousands of people came to Australia from overseas countries between 1851 and 1900 to try and strike it rich during the Australian gold rushes. One of the largest groups was from China. What happened when these Chinese gold diggers came to Australia in the 19th century? That’s what students are able to explore in this unit. The main way of doing this is through the visually rich Australia China Friendship Society and National Museum of Australia’s Harvest of Endurance scroll. Students explore and images of what happened, and test those images against other evidence. help us to understand the Yirrkala petition? This inquiry case study explores the Yirrkala petitions that were presented to the Australian Parliament by the Yolngu people of Arnham Land in 1963. These petitions were very different to the usual petitions to Parliament and in this unit you are going to see what happened to one petition, and work out from the evidence why it succeeded or failed in the way it did. • Why did a world war start in 1914? • How did the Australian Government react? Why? • How did the Australian people react? Why? • Why did men and women volunteer to fight? • Was Australia involved in ‘other people’s’ war? 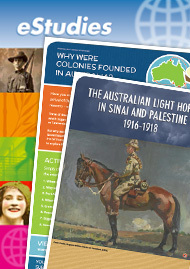 This inquiry unit presents some of the evidence in the National Museum of Australia exhibition to help students explore life in Australia 100 years ago and ask themselves how much has changed and what has stayed the same. Were these really 'Glorious Days'? Will this society go to war? In 2014 we will be commemorating the 100th anniversary of Australia’s entry into and experience of the First World War. One of the key areas of this commemoration will be an exploration of the Australian military experience, and the creation of the Anzac Spirit as part of Australian nationalism. 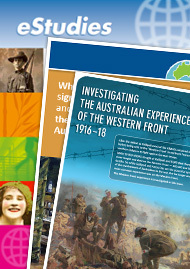 This evidence-based classroom activity encourages students to explore our society in 1913 to better understand how Australian military involvement in the war influenced national identity. How did Aboriginal Australians react to British colonisation? The lives of Aboriginal and Torres Strait Islander peoples were profoundly changed by the arrival of British colonists in 1788. Lives were lost and land taken as the colonisers attempted to impose new social, economic and religious orders. New animals, plants and diseases were introduced. The question every Aboriginal person faced was: how do we react to this situation? In this unit we look at the Resistance exhibit in the Gallery of the First Australians at the National Museum of Australia, to explore some examples of the different ways Aboriginal people responded to that question. Looking for more Australian History resources? What do I need to view the eStudies content? Each eStudies article is an interactive PDF. Some PDFs contain video content. Logged in users will be able to view the videos in the PDFs or online. Please note that iPad users can view the PDFs, however they will need to download a compatible PDF Reader App. You can read more about this and view the recommended free and paid apps in our FAQs.